Here’s what we have discovered to be the most common causes. Iron Oxide Stains from a variety of sources. 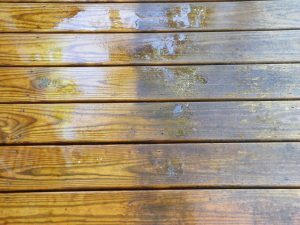 These stains show up after the first rain wets the deck after the contaminant comes in contact with the surface. 1) The new grill and deck furniture that was assembled on the deck surface, metal filing from assembly process and/or manufacturer. 2) Shavings from steel rails that were cut on the deck surface. 3) Steel wool that was used to clean or prepare the wood for finishing. 4) Some roof shingles contain iron oxide granules as do steel siding and some gutters. 5) Any grindings, that find their way to the deck surface. Here is a recipe to create a liquid that will darken wood intentionally. Put a course steel-wool pad in a plastic jar with a plastic lid, this is best to use because the lid won’t rust. Add enough ordinary white vinegar to cover the steel-wool and loosely screw on the cap. Set aside for a day or two. Strain the vinegar through a cloth, don’t squeeze the vinegar out of the pad or you will get bits of metal in the liquid, which will rust and make finish less even. Consider using a magnet to sort the solution. Note: The wood must be sanded as the solution doesn’t work well on planed wood.